Paul Colbeck Attains His "Assessing Competence in the Work Environment Level 3’ qualification. Paul Colbeck of GeoShield Limited recently obtained his ‘Assessing Competence in the Work Environment Level 3’ qualification. This is a comprehensive and nationally recognised qualification that covers the principles and practices of assessment including the assessment of occupational competence in the work environment. To become qualified to deliver and assess vocational qualifications in the work environment Paul had to put in a lot of hardwork and dedication before passing a variety of exams on topics such as how to assess competence based skills, the principles & practices of assessment and how to assess occupational competence in the workplace. 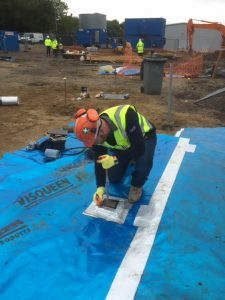 As active Associate Members of the British Geomembrane Association (BGA) GeoShield are striving to promote the BGA’s ethos of good practice within the construction industry for all levels of application pertaining to protecting new constructions against the ingress of hazardous ground gases. Thanks to his new qualification and in conjunction with the British Geomembrane Association administration Paul is now involved in the assessment of applicators seeking to gain their NVQ Level 2 in the installation of Gas Membrane Systems designed to protect against hazardous ground gases (Radon, Methane, Carbon Dioxide & Hydro-Carbons). Paul has also been added to the National Specialist Accredited Centre (NSAC) Team which will help to raise the skillset levels of the Specialist Applicator teams, and it will, therefore, go along way to allowing more construction contractors to have fully qualified team leaders and allow greater choice for the Main Contractors and Clients when they are deciding upon which Specialist Application company to employ. Well done and congratulations Paul from all of your colleagues at GeoShield Limited.